Its founder once told the Irish Independent he wanted airfares so cheap “everyone can afford to see the world”, but Skúli Mogensen’s dream of low-cost long-haul travel came crashing down yesterday as Iceland’s Wow Air ceased operations. 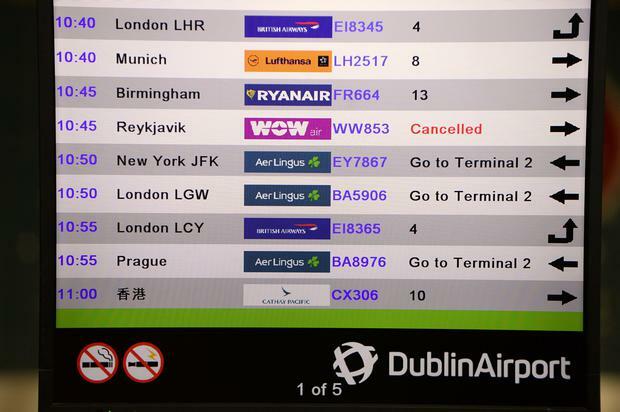 The collapse left thousands of Irish flyers booked on its route from Dublin to Reykjavik, and onwards to the United States, in limbo. They have also been left stranded at airports from Detroit to Washington DC en route to Dublin. Wow failed to secure fresh financial backing as it racked up losses. It has become another gravestone in a growing cemetery of bust airlines. Passengers waiting to fly on Wednesday evening and yesterday morning with Wow were uncertain the airline would keep operating. Just a short while before it collapsed, it issued a statement saying it was in the “final stages” of raising funds from investors. Flights had merely been postponed, it told passengers, until “documentation with all parties involved has been finalised”. A short while later, it confirmed the airline had ceased flying, with no new investment having materialised. Even hours before the collapse, Wow was sending emails to potential customers offering them flight deals. Icelandair – which had been in on-off talks with Wow about a possible rescue package for the smaller airline – said yesterday it is now offering discounted economy fares to help affected Wow passengers to get home. The special fares are available to passengers who have already started their journey with Wow and who have a return flight booked between yesterday and April 11. It also applies to flights between Reykjavik and Dublin. EasyJet is also offering rescue fares on routes from Reykjavik to London Luton and London Gatwick. Scandinavian carrier Norwegian – itself under severe financial stress – said it will offer “repatriation fares” from today, with a 25pc discount on economy fares until April 8. Wow’s failure has an impact far beyond inconvenienced passengers. Since its 2011 launch, it played a key role in boosting Iceland’s tourism at a time when the island was left reeling from the global financial collapse. Its failure yesterday even hit Iceland’s króna as investors fretted about the impact of Wow’s collapse on the country’s economy.